Following the events of his first arc since returning from "the sleep of the gods," Thor is completely and utterly exhausted. I suppose rebuilding the mythical settlement of Asgard and individually seeking out its inhabitants is a bit more work than one man can handle in a single storyline. This month, the Thunder God rests, which releases his mortal counterpart, Donald Blake, into the Asgardian streets. I'd enjoyed the few preceding chapters of this new Thor that I'd read, mainly because writer J. Michael Straczynski had been spinning a different type of yarn than I was used to. Where the book's previous runs had lost my interest by focusing on long speeches in Middle English and deep, frequent ventures into Norse mythology, Straczynski grabbed my attention by placing Thor in a modern environment. I liked the comparison between the modern perspective and the ancient sentiment of the Thunder God himself, and felt it was a fresh take on a character that I'd long since grown tired of. With this issue, Straczynski veers from that path and returns to territory that should be familiar for long-time fans of the character. 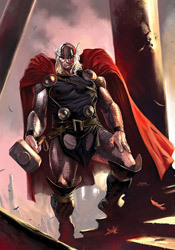 While he tries to balance this shift with an alternate storyline that focuses on Donald Blake's adventures in the modern world, the bulk of the story belongs to Thor. Within just a few pages of the story's return to high-and-mighty mythical themes, I was once again turned off to the character. I can understand that there's an audience for this kind of long-winded, complex storytelling with an ancient flavor, but I don't count myself among its followers. This issue feels like a huge step back to the status quo after the series had taken such a decidedly different direction with its first story arc. Marko Djurdjevic, most recently known for his work as Daredevil's cover artist, provides the visuals this month. Djurdjevic's style is something of an acquired taste, particularly when he's dealing with the actual Asgardian denizens. He never seems to fully take hold of the mythical setting, at least not in the same way he does the scenes taking place in the modern world. When we're following Donald Blake around America, his work is very good – his personality shines through in the details, which are abundant, and he constantly fills the frame with unique, inspired camera angles. When the setting switches back to Thor's perspective, be it in Asgard or another mythical setting, Djurdjevic's work stumbles. His characters grow stiff and overcomplicated, while his backgrounds lose those great touches of personality. He's a completely different artist when he's illustrating civilians than he is when he's portraying the heroes themselves, and I greatly prefer his work with the former. I'm sure many fans will rejoice at the release of this issue, hailing it a return to form for the series, but I found myself disappointed. Marko Djurdjevic's artwork has the unfortunate task of following up a run by Olivier Coipel that I absolutely adored, and though it has its own merits, it can't compare to what came before. J. Michael Straczynski's storytelling has slowed down markedly since the last time I read Thor, not to mention the change in direction, and before long I found myself counting the pages until the issue was finished. I'd flip through this, especially if you're a longtime fan of the character, but in my eyes it fell short.